The truth about saunas! Can you take the heat? One thing I’ve really enjoyed this winter is using the Far Infrared Sauna at the Integrative Health and Hormone Clinic! There’s nothing like warming up in dry heat. However, I cringe, when I hear one of my patients say that they built their own sauna, and I want to tell you why. Far infrared is a band of light (not visible) that is created by the sun and is felt as warmth on the body. Far infrared is effective because it penetrates deep into the body to elevate the body’s core temperature, inducing a low-grade, short-term fever that helps with numerous health conditions. 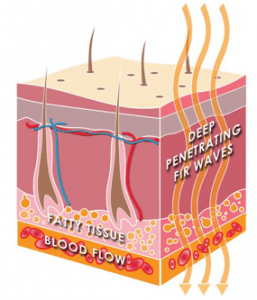 As far infrared is absorbed by the body’s tissues, resonant absorption occurs. When the frequency of the far infrared matches the frequency of the water in your cells, that’s when the magic happens. This activity causes toxins to be mobilized, releasing them from fat cells and dropping them into the blood, where they will be excreted via stool, urine, or sweat. Toxins hide in fat and when they are released, fat cells can shrink, equaling weight loss! How do you know if you could benefit from the therapy? Chapter 5 in my book, Your Longevity Blueprint, discusses how important detoxification is. We all are exposed to toxins. No one is home free! In fact, most American’s have between 400 and 800 chemical residues stored in our cells. These can come from the water and foods we consume, chemicals we clean with, and even personal care products we lather all over our skin. Sweating in a superb way to rid the body of this toxic burden! Saunas are also excellent for my patients who can’t exercise due to mobility issues. It is a way for them to still get their heart rate up and sweat without bearing weight on their joints. So why do I cringe when I hear one of my patients say that they built their own sauna? Some patients don’t realize that they could be increasing their toxic load if the sauna isn’t properly ventilated and the wood is stained with chemicals or assembled with glues. There are so many different sauna companies out there, and it can be difficult to determine which has the best quality. I personally use High Tech Health’s dry far infrared sauna. 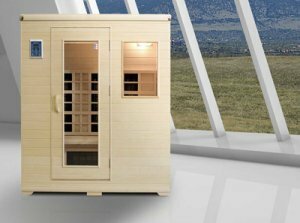 High Tech Health’s sauna has proven detoxification results, and it’s made out of imported untreated poplar wood! Another reason I love High Tech Health is they have conducted trials looking at sweat samples showing all the harmful heavy metals that were released during the sauna session. These include aluminum, arsenic, cadmium, lead, and mercury. Sweating has also been shown to help remove phthalates and plastics, PCBs, dioxins, and pesticides. This is pretty amazing! 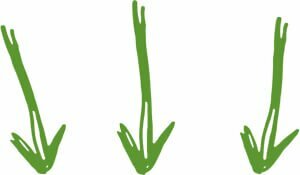 Typically I have patient start slowly at a lower temperature and short time, then increase the temperature and time to their comfort. I feel the best when I know I’m doing my part to reduce my toxic load and using the Far Infrared sauna a few times/week! Remember to stay hydrated and replace lost minerals like sodium and magnesium. To learn more about infrared sauna therapy, visit the High Tech Health’s website, www.hightechhealth.com, and use my name for substantial savings on a purchase. Free Far Infrared Sauna Session! We are offering your First Far Infrared Sauna Session at the clinic for FREE!